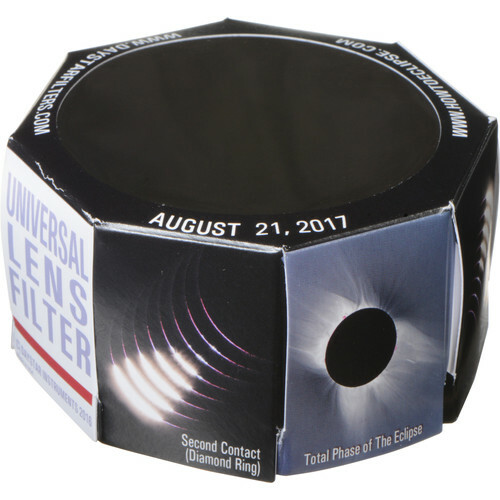 The solar eclipse of August 21, 2017 came and went in about two minutes at any given place along the path of totality, which stretched from Oregon to South Carolina. In January we decided to do the insane – drive hundreds of miles for a two minute event, then drive home. But by January of 2017 hotels were booked all the way from the Oregon coast through Idaho and beyond, let alone our first choice of Yellowstone National Park. And of those places that weren’t booked, $70 motel rooms were renting for $300 per night. So began the Internet hunt for lodging, and we somehow managed to find a motel on Hotels.com that had availability on the night before the eclipse for a normal $80 or so. 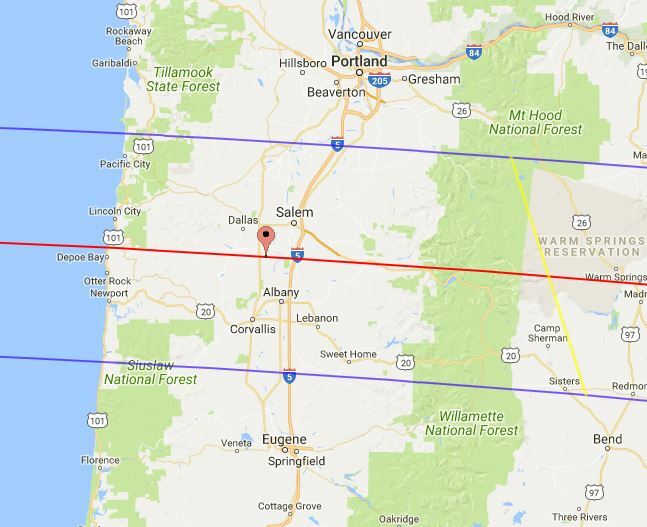 Not only did it have rooms, but it was in Salem, Oregon, only ten miles away from the center line of the eclipse’s path. We booked it immediately. The road trip would be about 800 miles each way. We would leave home on Friday evening at around 6pm and make a short jaunt to San Jose. Then on Saturday it would be on to Grants Pass, Oregon and on Sunday afternoon we’d arrive in Salem. As our trip date approached we scouted other possible locations. There was another small cemetery nearby, a small park on the river’s edge, and a few roads that led to some possibilities. We decided that we’d try to get to Salem early on Sunday so we could scout out the places we picked the day before the eclipse. 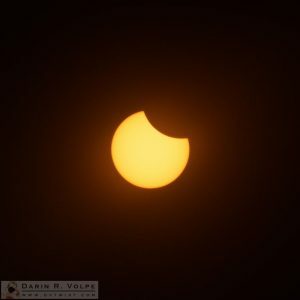 About two weeks before the the big day I decided I’d need a solar filter for my camera. Not necessarily for photographing the partial eclipse, but just so I could point the camera in the right direction so I’d be ready for totality. The filter was just a cheap piece of Mylar attached to a piece of cardboard that, once folded, would fit over the camera lens. Amazing what you can get someone to pay $17 for. As luck would have it they were out of stock, but I placed my order anyway and hoped it would ship out to arrive before our trip. It arrived just a couple of days before we left. The drive was uneventful until we started getting close to Mt. Shasta. There were several wildfires burning in northern California and southern Oregon, and the sky was filled with smoke that at times was so thick that we couldn’t see the nearby mountains. Even Mt. Shasta was completely hidden and could not be seen from the freeway. The skies didn’t clear up until we crossed into Oregon and were approaching Grants Pass. The motel was small and we were given a room about midway between the main road and the back. We were assured it would be a quiet room, and it probably would have been had it not been for our neighbor. The TV in the room next door was on all night and at a volume that would have been considered loud during the day. Hence we were up and on our way the next morning before dawn and with very little sleep. Our plan had been to get to Independence to scout around by 2 or 3pm – we were there at 11am. We checked a city park we ran across along the way first. It was a nice place, but was full of tents with only one way in and out that we knew would prove to be a nightmare to drive after the eclipse. It was also quite a bit farther south than we wanted to be, so we filed it as a possibility and moved on. Next in line was the park along the river. Again, only one way in and out and it only had about a dozen parking spaces. We decided this place would be a zoo on eclipse day and moved on. The small Hilltop Cemetery was the perfect spot, but we were concerned about available parking. Parking along the street was in the weeds and not ideal for my Mustang. 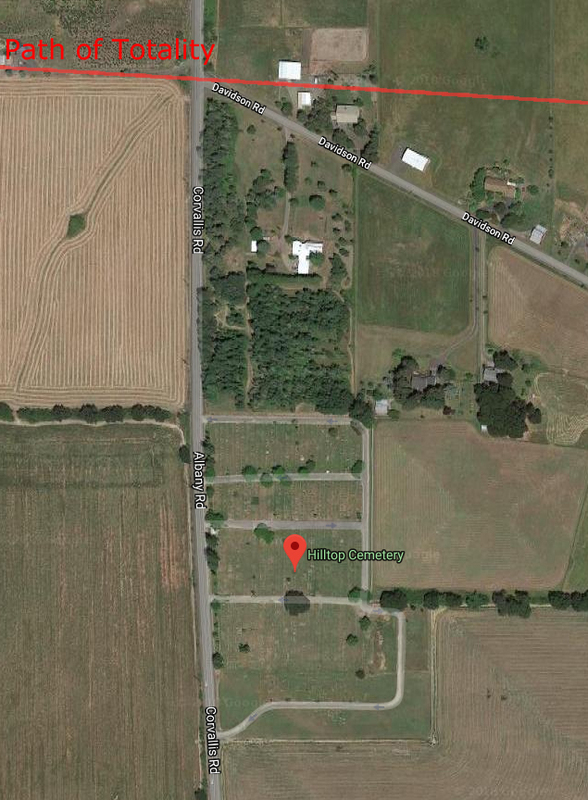 We were also concerned that with all the eclipse viewers in the area the cemetery might be closed to cars. There were a couple of spots where we would be able to park, but only if we got there before anyone else. The other cemetery and a nearby state park were OK, but there were lots of trees that could obscure the view if we didn’t find a good spot before everyone else. We decided that the next morning we’d head to the first cemetery, and if parking wasn’t available there we’d head over to the nearby state park. We checked into our motel at around 3pm. We selected a room around back near the freeway. The walls seemed to block out the sound of traffic surprisingly well, the A/C was quiet, and we settled in for the evening. Or so we thought. The first thing we noticed was that the toilet leaked and every few minutes there was a rush of water to fill the tank. OK, we can live with that by turning off the water supply until we needed to fill the tank. Then the upstairs neighbor started dragging the furniture around and it sounded like they were rearranging the room. I could hardly blame them for the noise, some genius at the motel decided that putting heavy steel chairs on a wood floor was a good idea. It was not. We got into bed to relax since our morning started so early when we felt something bite. Pulling down the covers, there it was. A small black dot. A small black dot that leaped away in a single bound, but there was no mistaking what it was – a flea. A visit to the desk was in order. The poor desk clerk was all by herself by now and promised to come over with new bedding as soon as she could break away from the desk. There were no new flea sightings, and when she arrived we were informed that the person who had the room before us had a service dog. Bedding changed, we settled in – constantly looking for the flea and wondering if she had any friends in the room. But she seemed to be alone and unwilling to show herself again, so we once again settled in to rest. Then the furniture movement happened again. I stepped outside, looked up at the open door and people standing in the doorway, and gently informed them that “I don’t know what you’re doing up there but it’s making a Hell of a lot of noise downstairs.” That seemed to stop the sound for the most part and we finally went to sleep – until 4am when the boiler on the other side of the wall went off like a Gatling gun. No alarm clock needed on this trip, apparently. We took our time getting on the road the next morning and didn’t leave the room until 8am or so. People were in the motel parking lot setting up tripods and cameras as we drove off to the cemetery. We expected maybe a dozen people in the small area – the place was full of cars and at least a hundred people. No danger of the cemetery closing to cars. We pulled into the cemetery, parked on the side of a narrow road near the entrance, and scouted around for a place to set up the tripod. 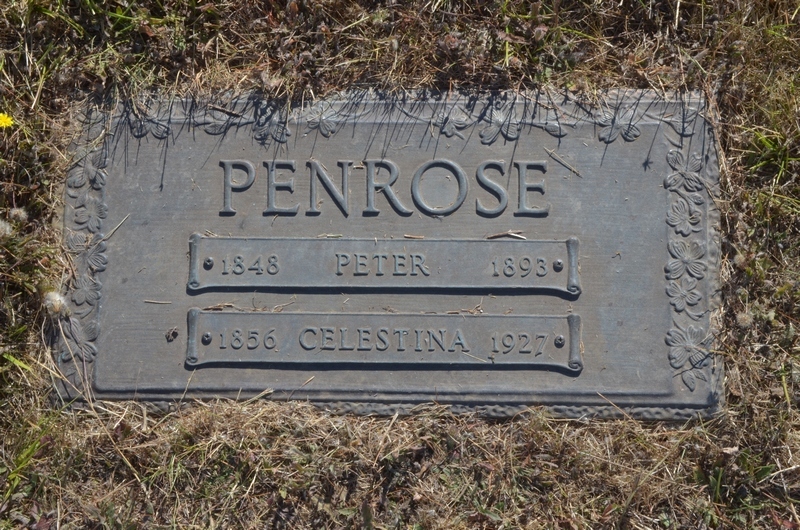 We ended up between two grave markers, one having been occupied since 1927 by an appropriately named “Celestina.” Off in the distance I could hear the fiddle of an Irish jig, then the obligatory playing of Pink Floyd’s “Dark Side of the Moon.” Fortunately it only lasted a few minutes as people settled down to watch the show. Now it was time to prepare for the big event. 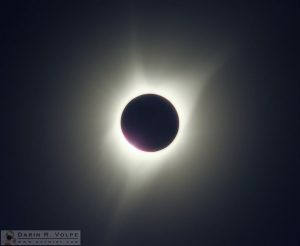 In the days leading up to the eclipse I had been reading up on exposures for the various phases. I decided to set my camera up to shoot five shot bursts increasing the exposure by one stop for each shot, then changing the exposure down by five stops to take the next series. By using the camera’s five shot bracketing bursts I would only have to adjust the settings 5 times instead of 25. I would use the slingShot app on my phone to control the camera (see my blog entry “Remote Camera Control Through My Android”) so instead of trying to work the camera controls during the Amazing Event, I would be able to make a practiced set of button pushes on the phone while still being able to experience the eclipse. I took a few test shots around the cemetery and a few of the partial eclipse with the cheap solar filter over the lens. In the shot to the right you can see the beginnings of the moon masking the sun. What was remarkable was that the brightness of the day didn’t change at all, even when the sun was almost completely hidden by the moon. Only when the sun was down to a tiny sliver did the lighting change, but it was still only as if there was a heavy cloud cover. The crowd started to get excited in anticipation at this point as they watched through their solar glasses as the last sliver of the sun was covered. All at once darkness came. It wasn’t the dark of night that many would expect, more of the dark twilight just before the stars appear. I honestly expected to have some more warning. I had my camera set up to record the “diamond ring” effect – where the last bright spot of sunlight appears as the rest of the sun is masked, but that was gone in an instant and I ended up with a series of underexposed shots of the corona and this shot with a tiny bright spot of the disappearing sun in the lower left. I quickly reset the camera settings and started my series. The first shots were at 1/8000 of a second which left the sky black. Then they cycled down to 1/4000 and 1/2000. I reset the camera and shot the next series down. 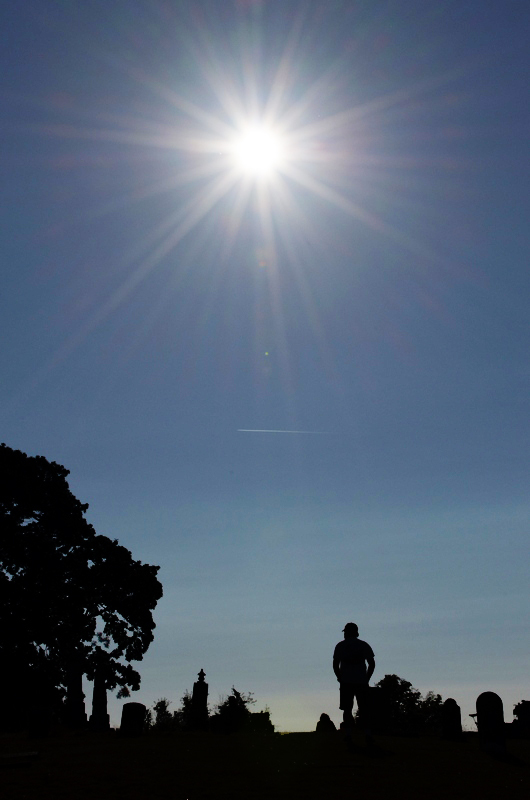 It was hard splitting my attention between the sky and my phone – I was determined to experience the eclipse live and not through a viewfinder or phone screen. As it was, my well-practiced series of photos took an unexpected but fortuitous turn of events. 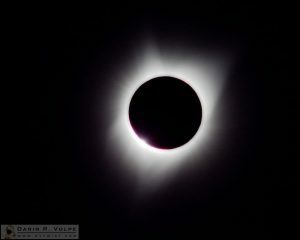 Since I got a late start at the beginning the eclipse ended while I was still on my second-to-the-last series of photos. This ended up giving me just the right exposure when the sun came out to capture the lens flare photo – if I had started on time when the eclipse began, this shot would have been overexposed. The sky lit back up instantly when the first sliver of the sun peeked from behind the moon, and it was all over. We wandered around the cemetery for the next hour as the eclipse-chasers slowly departed. The drive home was slow-going. Not only because of all of the cars heading back down to California (by the time we got to Medford there were more California plates than Oregon plates,) but also due to what seemed like endless road construction. We spent one last night at the Evergreen Lodge in Mt. Shasta (an actual clean and quiet motel for a change) then powered back home in a single day.